I feel like I’ve been kind of a Negative Nancy lately, so I hopped on Saks.com hoping to write about something I really like for you guys. Unfortunately, instead of doing that, I have to be negative again. And it’s all Gucci’s fault. 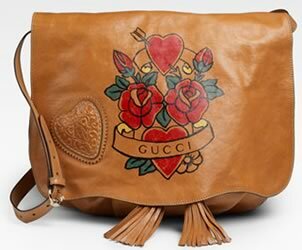 The Gucci Tribeca Medium Shoulder Bag is a disaster. Of epic proportions. And that’s coming from someone that normally really likes Gucci, even when they get a bit wacky with their designs. I usually understand what they’re up to, but here…there just are no words. It’s a big bag with a skinny, tiny strap – bad proportions! It’s got a textured heart inset placed randomly on the front – icky! And it’s got a big ol’ tattoo design in the tradition of the geniuses (and I say that facetiously) over at Ed Hardy right smack dab in the middle. Eww. I’ve heard rumblings of unhappiness with the Cruise collection over in our Gucci section on the forum, but I figured it would still have some redeeming qualities to most of the bags. Some of them aren’t so bad, but this? This is bad. I say this out of love, Gucci. I want you to make beautiful things. So please, for Spring, try harder. But, if you disagree, buy through Saks for $1,395.